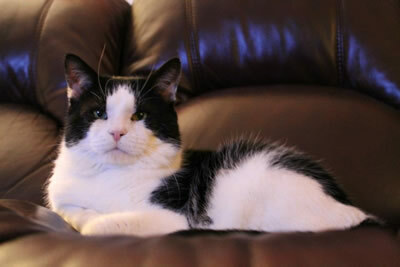 Bubba was one of our very distinguished citizens at Halfway Home Pet Rescue. 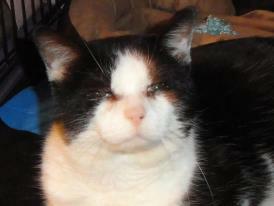 Poor Bubba had suffered his entire life with no place to call home, no medical care and all this time suffering with a very painful eye condition that cause blindness. It did not take long for this guy to steal hearts at HHPR. After examination by the Presque Isle Animal Hospital, it was determined that Bubba was in good health except for the eye condition called entropion. Entropion is a genetic condition in which a portion of the eyelid is inverted or folded inward against the eyeball. This results in irritation and scratches to the cornea — the front surface of the eye — leading to corneal ulceration, or corneal perforation. Poor Bubba could hardly open his eyes. HHPR decided to have the surgery done and give this guy a chance. Bubba came through the surgery very well and made a steady recovery. We posted his situation on our Facebook page and this caught the attention of many. But there was one special family who knew Bubba belonged in their home. The only obstacle – they lived across the border in Fredericton, New Brunswick, Canada and needed to wait until passports were ready. The adoption process took place long distance but we knew it was a perfect placement. 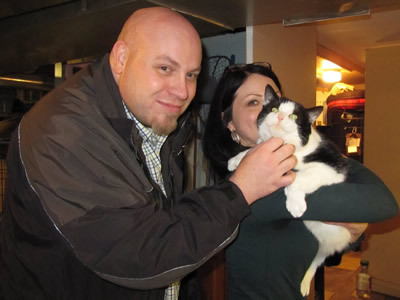 Alice Perkins and Andrew Ryder came to Caribou to meet Bubba and bring him home. Bubba at home. photo by Alice Perkins.